Screen saver settings windows allows you to select models to display and also some presentation settings. Models to display - list of models that will be presented while screen saver is running. When the list is empty, some built-in models are used. Use Add and Remove buttons to edit the list. LDD Repository file - location of db.lif file. This file contains all bricks supported by the LDD. 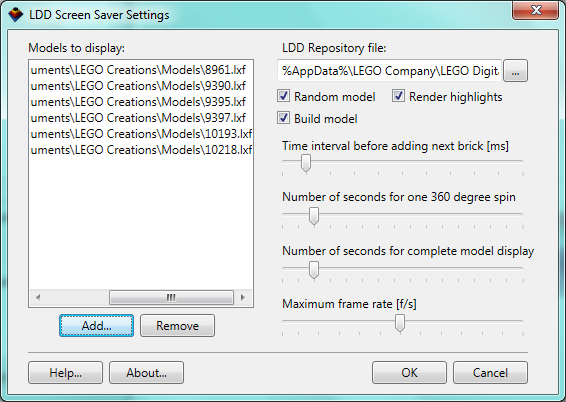 When using the predefined default location, the screen saver will fail to run while the LDD is running. Make a copy of the db.lif file to overcome this limitation. Random model - when checked, models are displayed in random order. Otherwise, they are presented in the same order as they are specified in the list. Render highlights - when checked, models are rendered at higher quality but require a faster graphic card for rendering. Time interval before adding next brick [ms] - this interval controls speed of building of the model. Lower value means faster building. Number of seconds for one 360 degree spin - model rotates during presentation and this value controls rotation speed. Higher value means more time for one complete rotation. Number of seconds for complete model display - this value specifies how long the complete model will be presented before switching to next model. Maximum frame rate - this value limits the maximum allowed frame rate to be used during presenting the models. Lower this value if you experience too much CPU usage. Lower value means lower CPU usage.